Here are some folks who are so totally stoked! The ACTSI’s Research Technologies program supported the Sucette Smart Soother in Georgia Tech’s sixth annual InVenture Prize competition through the ACTSI’s support of the Capstone Design Program at Georgia Tech. The Sucette Smart Soother is a modernized pacifier tailored to fit the growing dentition of infants, decreasing the adverse dental, skeletal, and speech deformations associated with extended use of current designs. Being "smart," the pacifier changes color when infant fever is detected as a simple diagnostic tool for parents. The team is made up of Rachel Ford, a biomedical engineering major from Powder Springs, GA; Esteban Ongini, a biomedical engineering major from Miami, FL; and Will McAllister, a biomedical engineering major from Charlotte, NC. “The team cannot thank the ACTSI enough for the support, which has enabled us to take our product further than we ever imagined. The prototypes look absolutely amazing, and we can’t wait to unveil them. Thank you for the continued support,” said Ford. The team will receive $10,000 and a free U.S. patent filing by Georgia Tech’s Office of Technology Licensing (valued at approximately $20,000) for placing second in the competition. 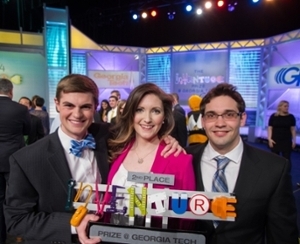 The InVenture Prize is an annual, faculty-led contest that rewards Georgia Tech undergraduate students for big innovations. The competition is broadcast live on Georgia Public Broadcasting.